Where seen? 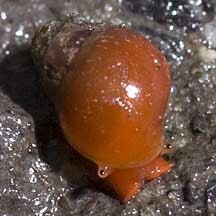 This tiny bright red round snail is commonly seen in groups on the surface of the mud in some of our back mangroves. Features: 0.5-0.8cm. Shell thin, smooth and spherical. Colour bright red, sometimes black. 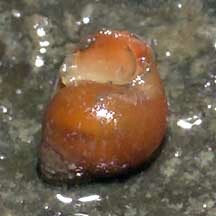 Operculum thin. The body is red too, with tiny eyes on short stumpy stalks. 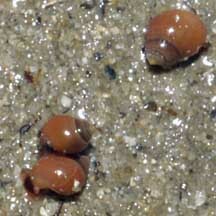 It breathes air through a lung (instead of through gills like most other marine snails). 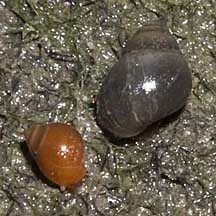 Many members of the Family Assimineidae are adapted to brackish waters. What does it eat? It probably grazes on the algae growing on mangrove mud. 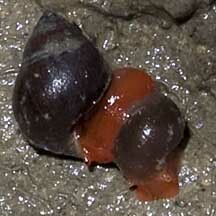 Red berry snail (Sphaerassiminea miniata) Ng, Peter K. L. & N. Sivasothi, 1999. A Guide to the Mangroves of Singapore II (Animal Diversity). Singapore Science Centre. 168 pp. 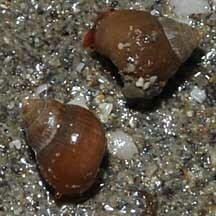 Red mangrove shell (Assiminaea brevicula) Tan, Leo W. H. & Ng, Peter K. L., 1988. A Guide to Seashore Life. The Singapore Science Centre, Singapore. 160 pp. 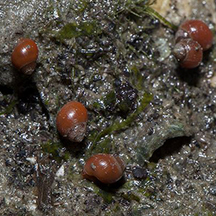 FREE photos from wildsingapore tagged with Assimineidae. Make your own badge here.